The first day of tournament play went great. The first part of the week is as much a practice round for the maintenance staff as it is for the players. It was nice to see the first day go off without any issues at all. Speeds and firmness continue to improve each day. We used the lattice turning boards for both shifts today again to help with wear issues on the collars. Between double mowing greens, single mowing collars and approaches, and rolling greens, the collars really take a beating. Each day collars and approaches have been mowed in the morning while tees get rolled with a squeegee to remove the dew prior to play. Fairways are mowed each morning from tee to green with a gang of six fairway mowers per side. A group follows with backpack blowers to disperse any clippings left behind. The bunker crews rake all of the bunkers inside the ropes. There are a couple bunkers that have the rope line right through the middle of them so half is raked and half is not. Most of the rest of the morning staff is either mowing greens or doing the ProGreens work. In the afternoon the tees will be mowed each day. Greens mowers and their ProGreens group have three greens at night due to the manpower needed to fill fairway divots. One of the more interesting afternoon jobs is the mowing of the intermediate rough. Four of the straits course employees go together and push mow all of the intermediates for nine holes. They can get it done in under 2 hours which to me is very impressive. One thing I haven't mentioned this week is the awesome networking opportunities at an event like this. I have met so many great new people from as close as Willow Creek right across town and as far away as England and Scotland. I hope to maintain these relationships throughout my career. Welcome to the Golf Course Maintenance Blog Page for Des Moines Golf and Country Club. It is our goal to provide you with useful information that is happening at DMGCC. Please check back often or follow us on Twitter at @dmgccsupt. Thank you. Certified Golf Course Superintendent and Master Greenkeeper at Des Moines Golf and Country Club. 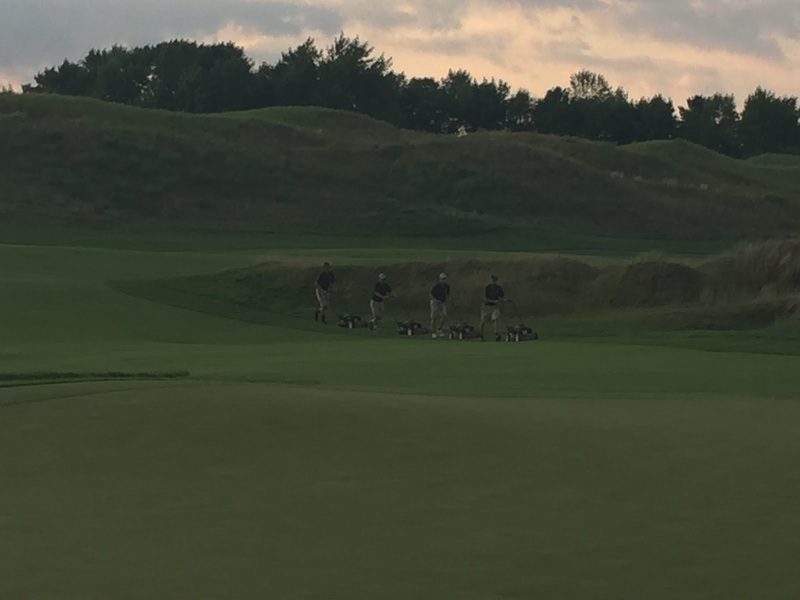 We hope you enjoy our blog as we continue to try to inform you about some of the items that we do in our golf course maintenance department.